Published: Aug. 10, 2015 at 04:15 p.m. It's time for football. No for real, actual football. The Hall of Fame Game marked the beginning of a new season. It also meant that the stock of various players will have even wilder swings in the next few weeks. Between injuries and on-field performances, where you draft players is going to change quite a bit before we get to September. It goes without saying, but having one of the NFL's best running backs potentially off the field for the first half of the season is going to have a pretty negative impact on that player's fantasy draft value. Just because Foster is out of the mix for a while, don't assume that the Texans are just going to hand the starting job to Alfred Blue or Chris Polk. 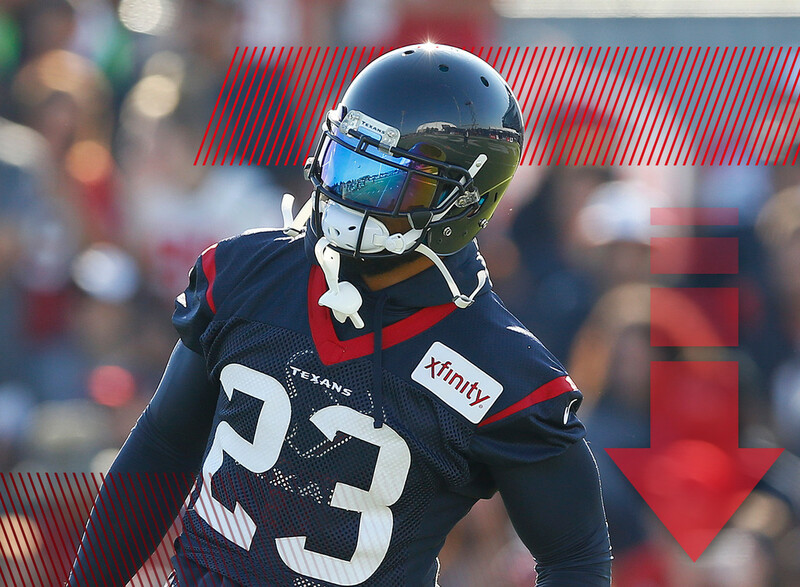 Keep an eye on what's going on in Houston before deciding on a Texans rusher. Last season's big breakout running back could be in line for even more work in 2015. New Ravens offensive coordinator Marc Trestman says the team plans to emphasize the running game. That's good news for a back who was a top-10 fantasy option last season despite beginning the year as an afterthought. It should also have a positive impact for rookie Javorius Allen, who could see some snaps as Forsett's backup. Apparently, running the football is the new policy initiative around the Beltway. Much like their neighbors in Baltimore, Washington's coaching staff is reportedly committed to running the football more in 2015. That's good news for Morris, who has seen his carries drop in each of his three seasons, yet still ranked among the top 15 runners in fantasy football each year. There's certainly a fear that rookie Matt Jones could be the team's goal-line threat, but we're on board with anything that could get Morris more touches. As if things couldn't get any worse with the Titans running game, comes news that the team could employ a committee approach this season. Being relegated to part-time duty isn't going to make Bishop Sankey any less of a disappointment to fantasy managers. Yet, it could also have the effect of hampering the development of rookie David Cobb. There's not much reason to be excited about Tennessee's running back offerings. This could also easily include Christine Michael, but Turbin was once thought to be the No. 2 running back behind Marshawn Lynch. However, even that could be changing if undrafted rookie Thomas Rawls continues to make waves in practice. There is a belief that Rawls could challenge both Michael and Turbin to be the backup to Beast Mode. Stay tuned to see who could be the handcuff option in Seattle. The John Brown hype train left the station some time ago and was already picking up speed. It's now careening down the tracks after Michael Floyd dislocated three fingers last week. There is a chance that Floyd could be ready for the season opener, but it currently seems unlikely. In Floyd's absence, fantasy enthusiasts have turned their attention to the diminutive speedster who flashed brilliantly at times last season. In last week's Stock Watch, I wrote that the Browns running backs are trending both up and down at the same time. This week, it's all bad for Terrance West. Reports from camp are that the second-year running back looks out of shape and is dealing with maturity issues. That's not the way to earn carries in a backfield that is expected to be loaded with talent and short on opportunities. With running back committees infecting offenses all over the NFL, it appears that the Broncos are immune to this fantasy scourge. Head coach Gary Kubiak says he plans to use one runner as a bell-cow throughout the season. Hello, C.J. Anderson. Last year, Anderson just missed finishing in the top 10 among running backs. With a full season of work, he could easily crack that plateau in 2015. If only Gary Kubiak coached every NFL team. If there's a quarterback competition going on in Philadelphia, no one's told Sam Bradford. The new Eagles signal-caller has taken all of the first-team reps in camp and is practicing without any restrictions. So any thought that Mark Sanchez could creep up and potentially steal the starting gig needs to be put on hold. Could we see another dependable fantasy tight end this season? We could if the reports that Eifert has been impossible to cover in practice bear fruit in the regular season. Either way, the Bengals offense could be as good as its been in years, and Eifert could pay dividends both on the field and in fantasy.